The Huskies are returning to the NCAA tournament for the second time in the last five seasons. 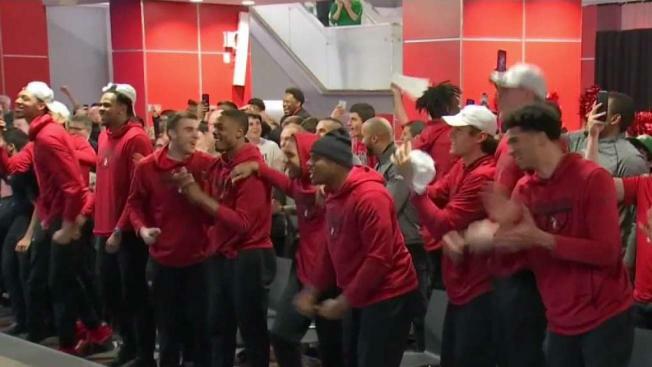 The field of 68 is set, and the Northeastern Huskies learned their fate during the NCAA selection show Sunday night. The Northeastern men's basketball team was selected as a No. 13 seed in the Midwest Region and will take on No. 4 seed Kansas in the first round of the NCAA Basketball Tournament. When the Huskies found out, the team erupted with screams. The players on the team, especially the seniors, know these opportunities to play in the Big Dance don't come very often. They say this is their time to shine in the national spotlight. The Boston team will be going up against perennial college basketball power house the Kansas Jayhawks, and the campus is buzzing with high expectations. “I think they are going to go far,” one student said. This will be the second March Madness appearance for the Huskies in the past five years, and the team is peaking at just the right time. They’ve won seven games in a row after beating Hofstra University in the Colonial Athletic Association title game. Head Coach Bill Coen, who is now in his 13th season at the helm of the program, knows his team is the underdog but is hoping to be this year’s Cinderella story. “Once you’re in, anything can happen,” he said. This will be Northeastern's first-ever meeting against Kansas in program history. The 2019 CAA Champion Huskies (23-10) locked up their NCAA tournament bid with an 82-74 victory over Hofstra on Tuesday night. This will be the team’s ninth time competing in the tournament in program history. The Jayhawks (25-9) finished third in the Big 12 Conference standings and advanced to the conference title game before falling to Iowa State in the final. The team is led by All-Big 12 First Team selection Dedric Lawson. The Huskies and Jayhawks play on Thursday, March 21, in Salt Lake City, Utah. Yale and the University of Vermont are the other two New England schools in the tournament.